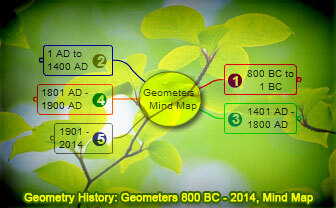 Geometry History: Geometers from 800 BC to 2014, Interactive Mind Map. Elearning. Instructions. To link: click a red arrow. To Fold/Unfold: click a branch. To Pan: click and drag the map canvas. List of Geometers, Interactive Mind Map based on Wikipedia: List of Geometers. Geometer. A geometer is a mathematician whose area of study is geometry. Mathematics. Mathematics is concerned with numbers, data, collection, quantity, structure, space, models and change.